See you at the SuperSale Bazaar! Thank you to ALL those who liked my poster in the SuperSale Bazaar FB page! SuperSale Bazaar Summer Edition – The Hottest Sale of The Year! While the calendar year officially starts with January, there's something about March that feels like an exciting new beginning. In addition to ushering the feeling of beach season coming, March also serves as a host month to officially welcome the summer—our favorite fashion season. In honor of turning over a new sartorial leaf, the SuperSale Team has become fixated in rounding up your favorite online brands as well as local designers for a 3-day trunk show, all under one tent. The weather is finally starting to heat up in our neck of the woods, which means the SuperSale Team focuses on one thing- coming up with the biggest sale event to kick off the summer. The much-awaited event that we’ve all been longing for is our first for the year and the 12th under our belt. We had to shuffle our fashion playlist for summer as we welcome a lot of new labels to spruce our line up. Local and imported brands have been handpicked to showcase their latest beat-the-heat ensembles and last year’s collections for this year’s first summer sale event. You get to be the first to shop your favorite labels and at a very low price of up to 90% OFF! We will not only house the usual suspects composed of online designer names like Moonshine, Celline, Glitterati, Style Break, Fancy Flats, Tonic, Vida Jewelries, Tocande, MADE Jeans, I Love Koi, Soak Swimwear to name a few; but we will also be welcoming established local and imported brands from apparel to make up. In addition to amazing clothing and accessory options, The SuperSale Bazaar offers an incredible selection of electronics of up to 80% off via the DealDozen booth. Whether it's an exciting interpretation of the new jumpsuit silhouette, the incorporation of au courant leopard accents, or the flawless balance of a floaty caftan with high-waisted swimsuit, these trendsetting pieces are here to remind us that SuperSale is truly THE event for the fashion forward. 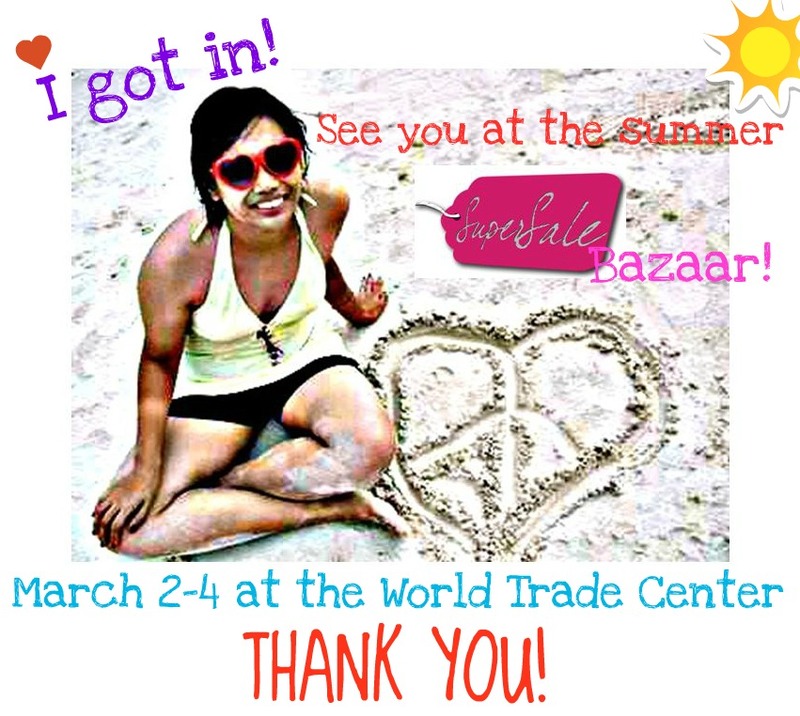 So without further ado, we’d like to invite you to come shop with us this March 2-4, 2012 at The SuperSale Bazaar Summer Edition to be held at The World Trade Center from 10am-9pm, Friday-Sunday. Giveaway alert! 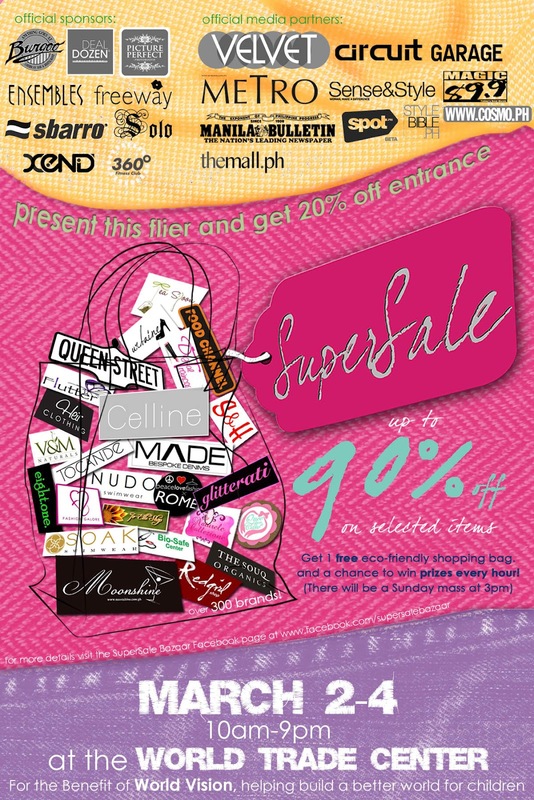 Get a chance to go to the Supersale Bazaar for FREE! "I want to go to the @supersalebazaar this March 2-4 for FREE! Details in @anagon 's blog: http://www.anagonzales.com/2012/02/see-you-at-supersale-bazaar.html"
Congrats ate ana! :) See you!